Researchers at RMIT University, who have recently published their work in micro/nano-science journal <i>Small</i>, have created electronic wearable ultraviolet light sensors that outperform other sensors. 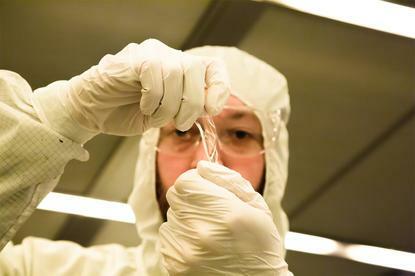 The stretchable, transparent sensors can be worn as skin patches. The researchers found nanopatterned zinc oxide (ZnO) on an elastomeric substrate is what makes better sensing performance over “rigid” ZnO counterparts. “This thin zinc oxide layer is engineered with a plate-like structure that we call micro-tectonics, these plates can slide across each other bit like geological plates that form the earth’s crust allowing for high sensitivity and the ability to bend and flex the devices,” explained the lead author of the research paper and PhD researcher, Philipp Gutruf. According to the researchers, the thin sensor patch – which is 100 times thinner than a sheet of paper – is unbreakable and cheap to make. The sensors can also detect toxic gases such as hydrogen and nitrogen dioxide. When testing and comparing the flexible ZnO/PDMS (polydimethylsiloxane) and rigid ZnO/silicon sensors on hydrogen, the ZnO/PDMS far outperformed the other in sensing speed, recovery and sensitivity. “Hydrogen leaks can lead to explosions as happened with the Hindenburg disaster and nitrogen dioxide is a major contributor to smog,” said Dr Madhu Bhaskaran, project leader and co-leader of the RMIT Functional Materials and Microsystems Research Group.